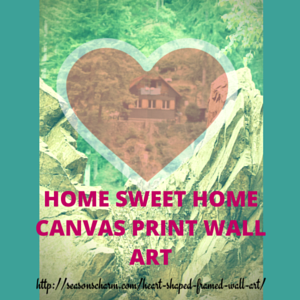 The Thomas Kinkade Heart Shaped Framed Wall Art Canvas Print Countryside Cottage reminds you of home sweet home with its warmth and laughter. It would make a wonderful housewarming gift for new home owners shifting into their new home sweet home. Featuring a lovely cottage in the tranquil countryside filled with pretty colorful flowers, the wall art on canvas print comes in a mahogany heart shaped frame complete with an elegant golden trim. Warm glowing light from inside the cottage looks welcoming and gives the impression of a home filled with love. Home is indeed where the heart is. For some, it might even bring back nostalgic memories of happy carefree childhood days living in the countryside. You can easily hang it up for display as there is a built-in hanging device at the back of the picture. The heart frame measures approximately 8″ x 8″. 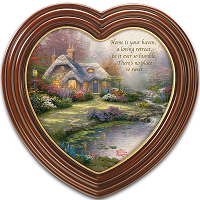 A gift of love, the Thomas Kinkade Heart Shaped Framed Wall Art Canvas Print Countryside Cottage is a wonderful housewarming gift idea.